Last fall after a trip to Asia de Cuba, an over-stuffed, slightly-buzzed me, happened upon the YuForia frozen yoghurt stand in Covent Garden. I didn’t have the greatest opinion of it. Since then I’ve had a few different frozen yoghurts in London, which have brought me to the conclusion that I’m not such a fan of English fro-yo. Why? Because I want it to taste like ice cream. It’s not such a crime, really. The Americans can do some bloody marvelous things with lo-cal frozen desserts, and I don’t feel that just because I moved 4,000 miles away, I should have to suffer with a ‘treat’ that tastes like someone put my Activia in a freezer. And that was that. Until YuForia started following me on Twitter, claiming that I wouldn’t be able to tell the difference between their chocolate fro-yo and ice cream. A challenge if I’ve ever heard one…. 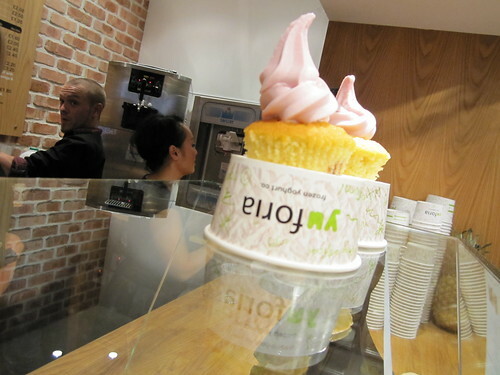 A few weeks later, I was invited to the launch of their new Soho shop on Beak Street (across from Polpo, lucky devils) to sample this chocolate fro-yo and other yoghurt-based yummies. I was almost immediately handed a yoghurt-based frozen chocolate/Mount Gay Rum drink and fro-yo cupcake from Sweet Things. The cupcake was amazing. I remember them from the Best Cupcake Recipe judging I did last summer. Sweet Things came in a not-too-shabby-third (out of 15) behind Fair Cake and Bea’s of Bloomsbury (not Lola’s as I originally said in a first draft of this post). There wasn’t too much yoghurt on top, but what was there, I liked alright. I won’t say it tasted like ice cream, but it was close. 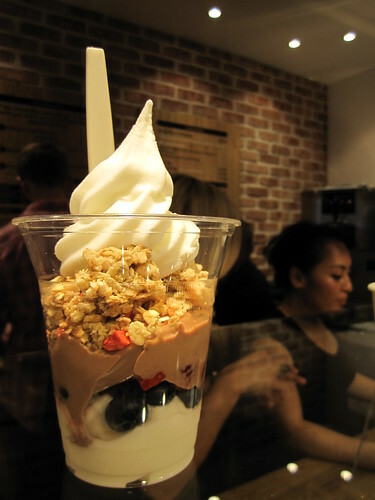 Chocolate and natural frozen yoghurt, mixed with blueberries, strawberries and granola. And you know what? They were right. The chocolate does taste like ice cream. Nice soft-serve-just-like-when-you-were-a-kid chocolate ice cream. The natural, more yoghurty stuff, I’m still not fond of, but the chocolate was a definite thumbs up. Well done, YuForia, you’ve changed my mind! We were invited to try our own concoctions, but two desserts in and I was spent. Still, YuForia has enough toppings for you to go pretty wild if you wanted to. If you’re watching your waistline though, make sure you stick to fruit only. I don’t care how low in calories frozen yoghurt is, once you stick fudge and honeycomb bits on top, it’s not healthy. 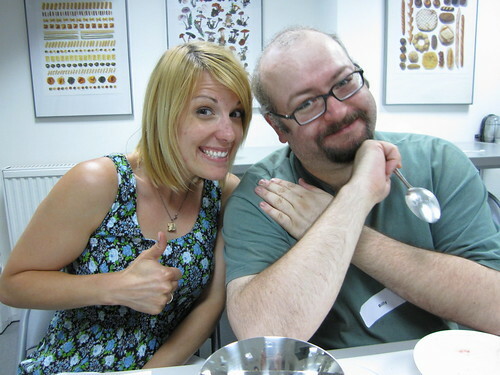 Disclosure: I was invited to sample YuForia for free along with a few other bloggers. I’ve given an honest review of the product. If the chocolate froyo didn’t taste like ice cream, trust me – you’d know. Last year I went to a whisky and cake event with Qype, Outsider Tart and Compass Box. I remember being so excited, what’s better than whisky? And cake? Together! And then, as I began to gorge myself, my stomach started took revenge. That’s when I learned (coupled with the Londonist ‘Best Cupcake Recipe‘ judging contest a week later) that too much sugar in one go is very very bad for you. So when I was asked by Billy if I wanted to be his +1 to a chocolate and whisky tasting from l’Artisan du Chocolat and The Macallan, I immediately said yes, and then immediately started getting nervous. Had I learnt my lesson? Yes. The key is moderation. Something I’ve previously not been very good at! The event took place at L’Artisan du Chocolat, a very posh chocolatier in Westbourne Grove. As you enter, you’re greeted by the most futuristic chocolate shop in the world. It could have been a room in Willy Wonka if the Willy Wonka factory was near the pod toilets at Sketch. As I walked in I was handed a Cocoa Pulp Bellini. Very yum. 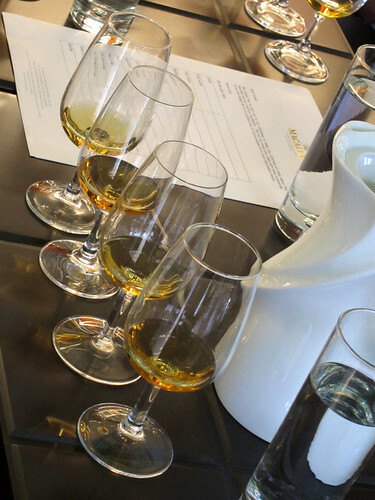 The tables were laid out with four tastes of Macallan whisky: the 12-year, 15-year, Select Oak and the Whisky Makers Edition. Now I don’t profess to be an expert on whisky, quite the contrary. I do, however, know my chocolate, so please excuse me if I focus more on that. If you’re interested in the whisky, Billy’s done a much more thorough job here on Billy’s Booze Blog. I hope he’ll excuse me from using his photos too – I, of course, forgot my camera that night. The next whisky was the Macallan 12, paired with the Mole Chilli bar. While I wasn’t too keen about either the whisky or the chocolate, I did appreciate the pairing. 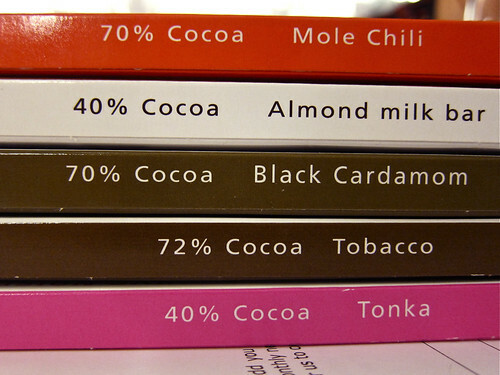 Gerry, from L’Artisan du Chocolat, explained the art of making a chilli chocolate bar, and it showed. The flavours were completely blended, where as many are just full-on chocolate followed by full-on chilli. Next up was the Macallan Select Oak, paired with the Artisan Almond Milk Bar, a delicious chocolate bar using almond milk, and thus, lactose free and vegan. The chocolate was surprisingly good. Very creamy and with just a hint of almond. With the whisky, it was easily the best combination of the night. The chocolate really brought out the creaminess of the whisky. And finally the Macallan Whisky Makers Edition, a very heavy whisky that was a bit much for me. They paired it with a ‘secret’ chocolate. As we tasted it, I was overwhelmed with smokiness. It was Tobacco Chocolate. I’m quite proud of myself that I guessed this first. The chocolate was an experiment for theArtisan team, and it’s an experience I’m not likely to repeat. The after taste of cigarettes was too much for me to handle, though the only smoker at the table seemed to like it just fine. Go figure. Those who didn’t like the tobacco were given a Cardamom-infused chocolate. I liked this better, though I’m not sure it’s something I would seek out again. After the whisky tastings, we were given special chocolate truffles made with a creamy inside and infused with the respective whiskies. By this time, however, my stomach was aching, and I’m sad to say I couldn’t quite handle any more. The goody bag was stocked with a lovely assortment of chocolates, and the Macallan 15-year, something I’ll happily enjoy at a later date. All-in-all a good night. Even if I wasn’t over the moon about each chocolate, it’s very evident that Gerry and the crew, know exactly what they’re doing. I’d never been to a supper club before a two weeks ago. I’ve always thought it was a cool idea, but for some reason, I’d just never gone through with it. But then I was invited to the much-lauded Fernandez & Leluu supper club. F&L (aka Simon and Uyen) were hosting a special event with Qype , sponsored by After Eight mints and led by the King and perhaps first-ever supper club master – Jim Haynes. So late one Monday evening, about 40 of us all pile into the secret supper club location, and eat Jim Haynes-style, which basically means standing up with plates and mingling while trying desparately not to drop our food. (It was as difficult as it sounds.) Normally, however, Simon and Uyen host abut 25 people in their living room, which my friend Sian described as ‘a magic supper club TARDIS’. Brilliant. I’d never given much thought to a summer roll before. They’re usually just a bit basic, but this one (the big honkin’ roll on the left side of my plate) left me speechless. 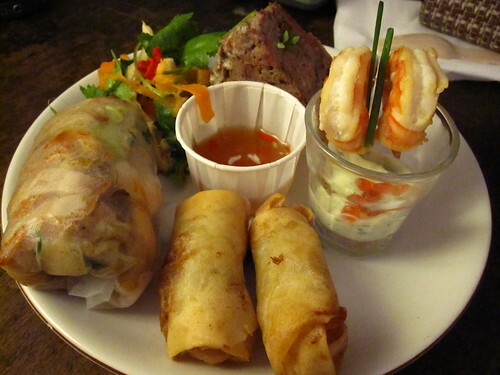 I never would have thought to put pork skin, barbequed pork AND pork belly in a summer roll, but wowza – I sure would now. Also a big thumbs up to the liver terrine. I’m not generally fan, but this was gorgeous. I wasn’t as big of a fan of this as I was with the starters, but mainly because it was way to difficul to cut it into manageable pieces. I ended up having to chow down on huge chunks when I really would have preferred to savour it a bit longer. Note: If holding a standing supper club, I’d recommend bite sized foods. Dessert was an absolutely amazing Trifle Of Croissant Bread & Butter Pudding With Whisky Raisins, White Chocolate Custard & Strawberry, Raspberry & Blackberry Soaked in Cointreau. 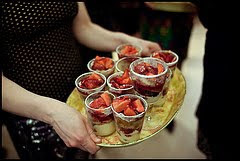 I was in love with this from the first bite – it was a beautiful explosion of fruit with just about the most boozey strawberries I’ve ever had in my life. If I wasn’t ipsy before this dessert, I certainly was after. 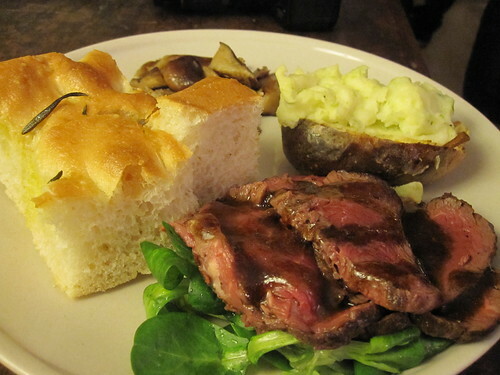 My first supper club may not have been traditional, but it was certainly good fun. I’m really excited to try Fernandez & Leluu, properly, if not just to have a chance to eat that summer roll again. If anyone has any other Supper Club suggestions, let me know! I’ve had a couple already, but would be keen to hear more. The Blaggers Banquet has left everyone pretty much exhausted, and I am no exception. I’ll post properly about it soon, but suffice to say it was an absolutely wicked time with some of the best food bloggers in the UK. My crowning glory, however, was the invent of the hashtag #jellyboobs – a tribute to what I’m sure was a scrumptious dessert that looked way too much like, well… you know…. I thought my serving days were over. I always told myself that after Pacific Rim, I would never work in a restaurant again. And, so far I’ve been right. 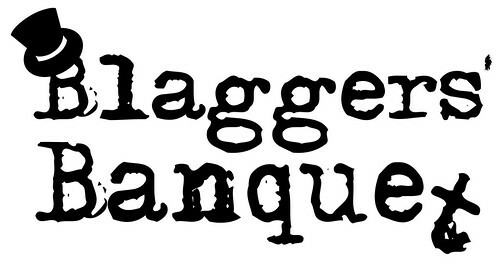 But now – for one night only – I will be returning to the front of house and back to my roots by bartending at the first-ever Blaggers Banquet. On November 15th, London’s Food & Drink Bloggers will be taking over Hawksmoor, the revered steakhouse in Liverpool St, for the Blaggers’ Banquet. A first for Londoners – the Blaggers’ Banquet will be an exciting 5 course dinner with matched drinks, created entirely by food and drink bloggers, and using only food and drink that they have blagged. All proceeds will go to Action Against Hunger. Bloggers will be the cooks and the sommeliers, front of house and the prep folk, the kitchen porters and the cleaner uppers. We’ll staff the bar, make the cocktails and make the coffee, and best of all diners can review us when we are done. The menu will feature Chapel Down sparkling wine on arrival, Wagyu Beef and sustainable yellow kingfish among others. There will be music on arrival and canapés. Vegetarians and people with dietary restrictions will be catered for. There will also be a blaggers’ auction, where we will be auctioning exciting items we’ve blagged. This auction will be two-fold: a portion of it on the night, and the rest in the weeks following. Tickets are on sale now on Ebay in pairs for £150 and one table of 5 for £375. Five pairs of tickets will be auctioned starting from £75.